A fantastic little Christmas TV special from the 1970s, A Pink Christmas is really a good show to watch! 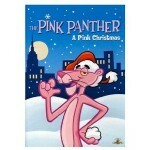 In this special, the Pink Panther is seeking out food as he has none this holiday season. While not exactly a retelling, this story does follow the O. Henry short story of 1906 called “The Cop and the Anthem” with the Pink Panther trying, at least at one point, to get into jail where it would be nice and there would be food. In addition, this collection also has two other TV specials: “Olym-Pinks” and “Pink at First Sight.” Enjoy all three instead of just one!